Dual 1" C.A. cutting head configuration for Nd:YAG laser. Laser beam enters to a 50/50 beam splitter. Kinematic beam bender mounts direct each laser beam to the individual laser process head assembly. Design incorporates equal length beam paths. 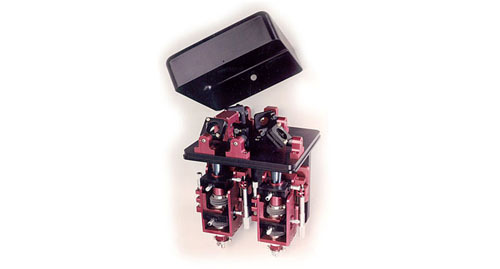 Each laser rpocess head assembly contains 1:1 galioean telescopes with X-Y axis micrometer adjustment on both elements, and independent micrometer adjustable with a telescope element spacing. Entire laser process head and telescope are adjustable with a micrometer. Laser process head contains optic cartridge for 18mm dia. x 50mm F.L. focus lens. X-Y-Z axis adjustment on nozzle. Replaceable copper nozzle tip. Sealed beam path system.